People are bringing food pantries to their front yards. Blessing Boxes are popping up in communities across the country as people find creative ways to help others who struggle with homelessness and hunger. 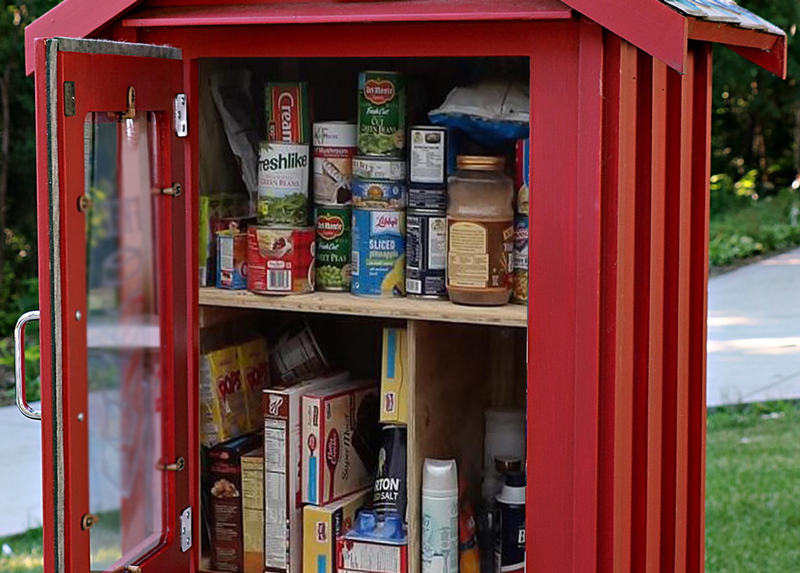 A Blessing Box is a small, often homemade structure where people leave donated goods for others to pick up anonymously. Located in a common area, people are filling them with items that will help those in need—everything from non-perishable food to toiletries. These donated essentials help fulfill short-term basic needs for those who don’t always have access to them. Pick a location. An easily visible spot located in an area where people are free to come and go is key. High-traffic community areas are ideal—close to a local church, community garden or library makes it simple for people to pick up things when they need it, and to donate. Keep in mind, you may need permission beforehand to set up your box. When in doubt, contact your neighborhood association or city official. Choose a container. It’s not difficult to build your own structure to hold donated items. Some choose to build a simple box on a stand and others have refurbished furniture. Just be sure that your box is big enough to hold a variety of items, and shield them from weather. Depending on your chosen location, there may be size limitations. Offer a variety. There are many things that people need on a daily basis. Some Blessing Boxes focus only on nonperishable items. Then there are others that also offer toiletries, like deodorant, soap and shampoo, and clothes, with everything from undergarments to coats. The choice is yours on how what you’d like to give. Encourage others to give. You can stock the box on your own or get others in your community to participate. If others give, there will be more items available for people to take if they’re in need. Don’t forget to create a sign that explains the concept. Something as simple as “Take what you need, give what you can” will work. Let others know. One of the fastest ways to spread the word is through social media. You can post information about it in a local city group, your personal social media page or sites like Nextdoor, a dedicated social network for neighborhoods. There’s no better way to change a community than one small act of kindness at a time. Blessing Boxes can make that difference. They present a low-cost way to help those in your community. Take these steps to start a Blessing Box today and make giving easy and accessible in your neighborhood.